Oklahoma artist Don Narcomey does more than create beautiful works of art. In a way, he performs a miracle by bringing the dead back to life. In broken branches and uprooted trees, Narcomey sees the potential for resurrection in their decay. By cutting away what’s been consumed by the passage of time, he uncovers the beauty hiding underneath. November’s episode of Gallery America explores the wood and mixed media sculptures of artist Don Narcomey. The latest episode of Gallery America premieres at 7 p.m., Thursday, Nov. 1 on the Oklahoma Educational Television Authority (OETA). Narcomey is a native Oklahoman whose work focuses on wood, metal and mixed media sculptures. His piece titled, Story Teller Chair, is on permanent exhibit at the Myriad Botanical Gardens in Oklahoma City. 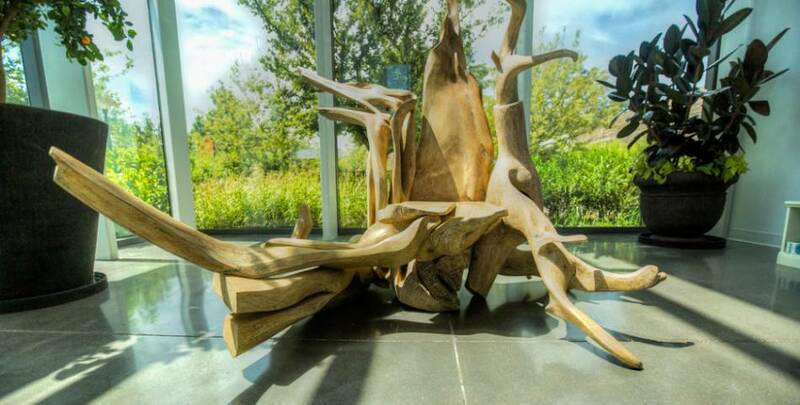 This piece is a one-of-a-kind mystical throne located in the Children’s Garden. Narcomey will also soon have a permanent installation in Oklahoma City’s 16th Street Plaza District. Gallery America is OETAs Emmy award-winning arts and culture series. Gallery America captures the best Oklahoma has to offer in all forms of art, including dance, sculpture, education, music, painting, photography and performances.